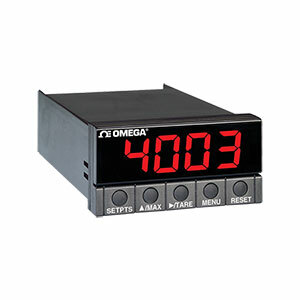 The OMEGA DP25B series Digital Panel Meters feature the biggest brightest display of any 1/8 DIN panel meter. The user can select the display color: RED, AMBER, or GREEN. The popular DP25B series are accurate, economical, and easy to program. The DP25B series feature a big bright four digit display plus optional dual 5 amp Form C (SPDT) relays and a choice of isolated or non-isolated analog output. The scalable 0-10 Vdc, 0-20mA, or 4-20 mA analog output can be used as a retransmission of the display value or as a proportional control output as required. The microprocessor based DP25B series includes instruments for Thermocouple, Process (DC voltage and current), and Strain Gage. The OMEGA DP25B-TC accepts type J, K, T and DIN J thermocouples. Standard features include resolution of 0.1° or 1.0°, °F or °C indication. Factory default setup is type K thermocouple input in °F. The DP25B-RTD series has been discontinued. Please see the DPPt series as a possible alternative or contact sales engineering department. Power: 12-32 Vdc; 7 watts max.